Exciting news! My Discover the Angels Angel Cards are now 'Hot off the press! Each card has been channelled by the angels with divine messages to help you with life decisions and assist you in your future endeavours. When I asked the angels to share their divine knowledge with me, the first thing they said was to ‘keep it simple’ and to share my own preferences when working with angel oracle cards. It suddenly struck me exactly what they meant! First of all, the cards would be small in size, making them easy to shuffle, and to carry with you on your travels. They are so compact they will fit in a handbag or glove compartment in your car! 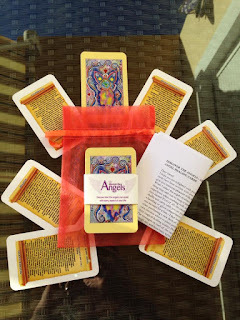 My next thought was that there was no need for a box – I feel they are too clinical, and the first thing I do when purchasing a new deck of oracle cards is to throw the box away. Placing your cards in a bag is much more user-friendly, and not only are your cards protected, they retain their magical healing quality. The messages on each of the cards has been channelled by the angels through me, and have been written with everybody in mind – both beginners and advanced users alike. I want you to feel happy and confident when using the cards and as the messages are so succinct, you won’t have to look up the meaning in an accompanying book. Did you know that I offer Angel E-Mail readings as well as Skype Readings? If you would like to book an angel e-mail reading please contact me via my 'Readings' page. During my Angel workshops 'Angel Breath' & 'Angel Magic (Getting creative with the Angels'), I teach attendees how to converse with the angels. When the angels are close, you can literally 'feel the breath of an angel' on your cheek. Angels are beings of light who serve as a link between us and God, and the word Angel is derived from the Greek word 'Angelos', which means messenger. In the hierarchy of Angels the Seraphim,are the highest order and the angels that we are most familiar with are the Archangels and our own guardian Angels. The Archangels can move up and down the celestial ladder at will and each Archangel has their own magical correspondence when dealing with us humans. Our guardian angels are around us every day and work as a channel between us, and the higher celestial beings. They are with us from birth and guide us to the light, when our earth body has passed away, and our soul 'returns home'. If you love angels, and wish to learn more about the ethereal realms, then why not come along to one of my Angel workshops? This beautiful workshop is about taking the first step in being able to communicate with the Celestial Realms and if you decide to take part, your Guardian Angel has guided you to this course and you may have already heard the voice of an angel or felt them close by. During my workshop you will learn how to build an Angel Altar, meet your Guardian Angel through meditation and feel the healing presence of Archangel Michael and his legions of light as he helps you to cut the ties with the past so you can move forward on your spiritual path. I will also teach you how to use angel cards and look for the messages they impart using your own intuition. You will meet like-minded people and this will be your special day so why not treat yourself? You won't regret it. If you are interested in attending please drop me a line via my contact details and I look forward to hearing from you. Places on the workshop will be awarded on a first come first served basis. This workshop is aimed at those who attended my Angel Breath Workshop where you learn the basics about how to connect with the angels, or for those of you who have worked with the angels yourself, but would like to learn how to cast Angel spells. During this magical workshop you will learn how to bring your inner child came out to play when making angel dust as well as understanding how the angels can bring so much magic into your life if you'll let them. If you are interested in coming along to another of these wonderful workshops please drop me a line via my contact page/reading page. I hope you enjoy looking at some of the photographs I took during recent workshops. See below for further details of what this workshop entails. This wonderful workshop is all about getting creative with the celestial realms - we will be performing angel spells and you will be making some angel dust to take home with you! This workshop takes you on a higher plane and is an ideal platform for those of you who want to understand more about the angels particularly those of you who attended the beginners course 'Angel Breath' workshop. Please drop me a line if you would like to attend - places will be awarded on a first come first served basis. please have a look at my Workshops & Events page Angel Courses & Healing. Coming soon - Angel meditations for download. Grounding, or’ earthing’, as it is sometimes called is about being aware that we are in a physical body but at the same time, endeavouring to become spiritual workers, and healers. Prior to opening up to the spirit world or carrying out any form of healing such as Reiki, it is imperative to ground and protect yourself so that you do not feel dizzy, disorientated, or take on the physical ailments of a client or patient. From a mediumistic point of view, it helps to protect and balance from any negative energy. So how do we ground and protect? Grounding - If you are holding onto any negative energies or worry, bring that energy down to the ground from your crown chakra, to your feet and into the ground. Once you have done this, you are ready to ground, by connecting yourself to the core of the earth. In order to do this, simply imagine growing thick and sturdy roots from the soles of your feet, and linking with mother earth. Once you have visualised this, you are ready to put a form of protection around yourself. Protection - There are different forms of protection you can try, and a few of them are below. However, the easiest and certainly protective measure (I feel) is to imagine a ball of energy over the top of your head which opens and sends a beautiful ethereal white light down through your crown chakra, past your throat chakra, heart chakra, solar plexus, down, and down, through your legs, and finally your feet. 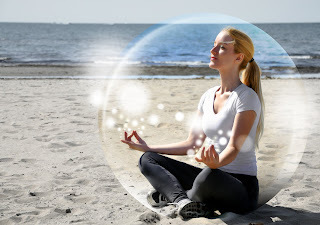 Then bring that white light around the outside of your body so you are totally cocooned in a protective bubble of light. Cloak – I like to do this over the white light so that I feel a double protection. Imagine a large cloak in purple or blue. The cloak reaches the floor, the sleeves are very long, and the cloak has a large hood. To ensure full protection, button the cloak up to the neck, and put the hood up. Gold Star –This is one I use at my Angel Workshops. Imagine a gold star over your head with six points. As it rotates, it scatters gold and white light down through, and around your body. You are surrounded in golden and white light. (Please note that some of these ‘symptoms’ above may be linked to illness so if you are concerned in any way, go to see your GP). How will I know if I have grounded/protected myself correctly? Drink plenty of water and walk in natural surroundings. Hug a tree! Everyone has a Spirit Guide – but who are they? Well, one of the questions I get asked a lot is “what’s the difference between a Spirit Guide and a Guardian Angel”? The only way I can describe the difference is that our Guardian Angels are purely ‘Angels’ and they have never inhabited a human body. Within the book Spiritual Unfoldment by White Eagle, he calls the Guardian Angel ‘Custodian of the Karmic Law’ which rules all life. They record all our deeds, and help us to work out our own karma. Our Spirit Guides are different to the Angels as they have lived in a human body. They are ascended spirit from the human line of evolution and have had spiritual experiences themselves similar to those that we encounter in our own lifetime. Our Spirit Guides are there to help to guide us on our spiritual path, and who best to guide us than someone who understands what it is like to have lived on earth? Our Spirit Guides are now pure spirit and have no ego. 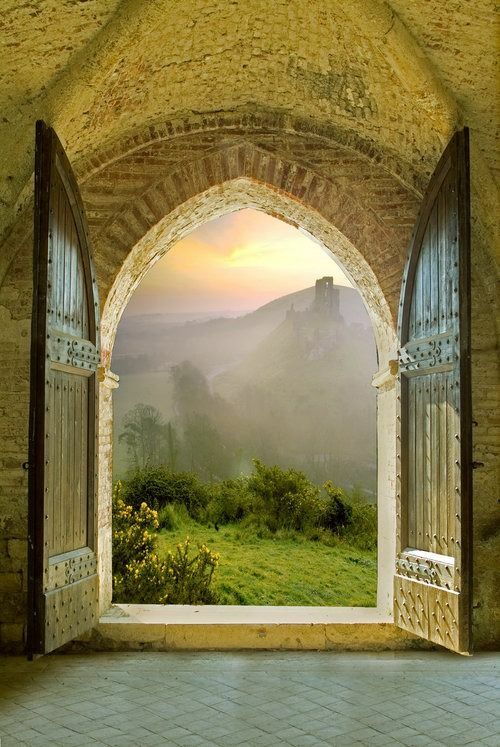 Our main guide is known as our ‘doorkeeper’ or ‘gatekeeper’, and they are the guide who is assigned to us before we are born, to help guide us in understanding life’s many lessons. These lessons could be experiences that have not been resolved from a previous life and we are given the chance to be re-born and find a solution to those problems in this life-time. 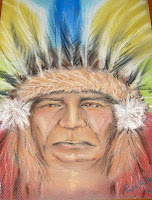 Your main spirit guide will stay with you throughout your entire life and helps you to fulfil your earth mission. Other guides may make themselves known to you at different intervals on your life’s path. How you meet your Spirit Guide is a personal experience and is unique to you, be it through meditation or another form of spiritual development. I met my main spirit guide Zamil in a vivid dream. When I woke up, I felt loved and comforted in a way I couldn’t explain. I knew without a doubt that I had met my spirit guide and a few months later I had confirmation of this whilst sitting in the garden where, when I asked, he gave me his name and also told me where he had lived when he had inhabited his human body on the earth-plane. 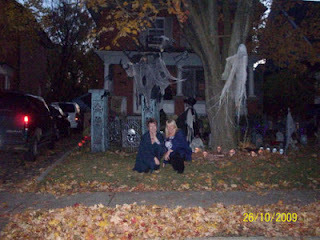 I have since met my other Spirit guides Ruby – who is my psychic art Spirit Guide and has a wonderful sense of humour, Star, who brings with her a nature spirit quality and is often accompanied by woodland animals, and Amy, who is a little girl spirit that works with me when I am working in Canada on the show Rescue Mediums. I speak to my Spirit Guides every day either through meditation or thought process called ‘telepathy’. Our spirit guides don’t have a voice-box so the voice we ‘hear’ will sound like our own, although the messages are coming direct from the spirit world. It is much the same when I am doing clairvoyant readings for a client. I know that any messages I receive either in word form or pictorial form are given to me by spirit and I love the confirmation I receive from a client about personal messages given direct from spirit no matter how bizarre the message appears to me! Our Spirit Guides never let us down. 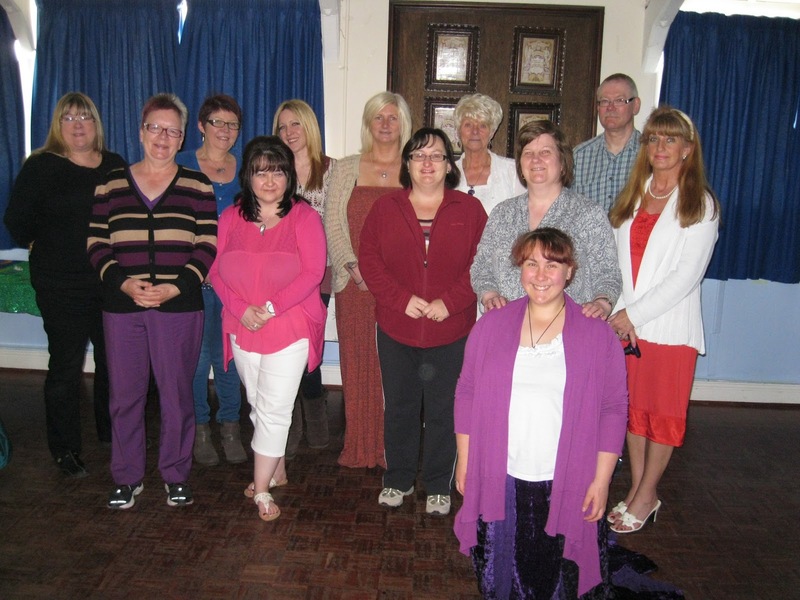 People will meet their Spirit Guides through different forms of communication such as meditation or in a group situation such as a psychic circle or through their local Spiritualist Church. Whichever way you choose to develop your spirituality please don’t give up if you don’t see your Spirit Guide at first. Your guide will develop you at a pace he or she feels is right for you and it is something that cannot be rushed. Everyone develops at a different pace and never compare yourself to others. I remember when I was in my psychic development class; I couldn’t understand why others said they could see their spirit guide and all I could see of mine were long sleeves. However, looking back now, all the signs were there – I knew it was my guide even though I couldn’t see all of him. Yes, I felt my Guide was male! - I could actually feel him beside me even though I couldn’t ‘see’ all of him in my meditation. Of course, he appeared to me (all of him!) in my dream, and after that, he appeared in meditations whether I was alone or part of a group and I have seen him many times since!. Never be disheartened, and never feel that you have disappointed your guide as they are here to help us to learn from any mistakes we make in life. After all, we are human and our Spirit Guides will always be by our side in love and forgiveness. As the saying goes, ‘to err is human’. Our Spirit Guide’s love for us is unconditional and to meet and communicate with them, is a very special and humbling experience. 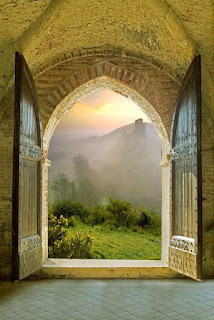 When we take a wrong turn in life, our guides will sometimes intervene to ensure we are guided back on the right path. If you are really stuck and need an answer, ask your guide to assist you and he or she will give you a way of resolving the problem. You may have to do some ‘digging’ yourself to find a solution, but if you want confirmation that you are on the right path, ask for a specific sign. These signs are often in the form of ‘coincidences’ or synchronistic events that your Spirit Guide has put on your path to make you sit up and take notice! Look out for the clues – they are out there. Once you have recognised them for what they are, remember to acknowledge this by thanking your Spirit Guide. After all, they really are your best friend. Orbs are a fascinating phenomenon and are something I have been interested in for years. But what defines an Orb? Orbs are a solid or transparent ‘ball’ of energy or light caught on video, film, or more recently, by digital camera. 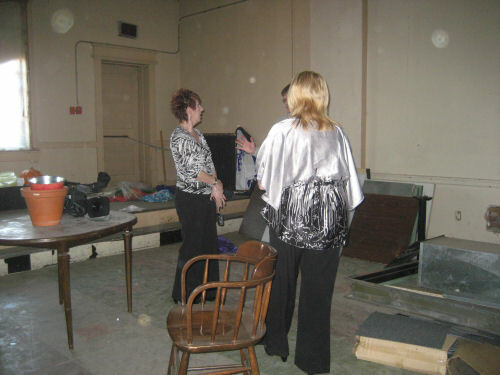 Orbs are easy to see when photographs are developed by digital cameras and have been scientifically proven to often be caused by dust particles, and malfunctioning camera diodes. However, Orbs are believed by many people to be life forms of those that once inhabited a physical body here on earth. Ghostly orbs are the most photographed anomalies caught on film, especially by ghost hunters. They can be completely transparent or display themselves in colour. I have taken photographs before whereby the orb on film appears to show a face. It is said that a culmination of orbs that appear on photographs taken outside on a wet night are most certainly going to be caused by moisture in the air from rain drops. But what about the orbs that appear over the same people’s heads at differing times of their life, and in different venues? It also leaves a question mark over why orbs often appear in photographs of mediums when they are ‘open’ to the spirit world and are also around the hands of healers when they are carrying out Reiki Treatments or Angel Healing. An example of reoccurring orbs around the same person, is when I take photographs of one of my small granddaughters. As soon as she could sit up and we started taking photographs of her propped up in bed for example, there was always an orb over her head. Two years ago John and I took her to the Police children’s Christmas party. There were lots of children there having fun and running around. When Father Christmas came in they waited patiently for him to call their name. When he called Olivia’s name, she went up to him to collect her present so I saw an opportunity, and took a photograph of her. Although there were lots of other children around her, there it was again, just the one orb, over her head. Is this someone protecting her? I would certainly like to think so. There are other theories concerning Orbs. On looking through differing sites whilst doing my research, some people believe that orbs could be nature spirits or airborne protoplasm which you would find under a microscope, only far, far, more advanced. 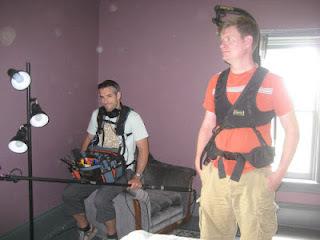 On Rescue Mediums, lots of photographs have been taken of us ‘in action’ and also relaxing. It’s interesting, that most of the ‘orb’ photographs appear in what is deemed to be the most haunted room in the home-owners house. A few examples of orb photography are shown on this page. What do you believe ????? Have a look at these.... what do YOU see?? “Well, now that we have seen each other”, said the Unicorn, “If you’ll believe in me, I’ll believe in you” – Lewis Carroll’s – Through the Looking Glass. I have loved unicorns ever since I was a little girl and this page is dedicated to those of you who also resonate with this ‘mythological’ creature I have had so many magical experiences lately regarding this beautiful and majestic creature that each event has made me more determined to find out more about the origins of the unicorn. It definitely seems to be one of the great unsolved mysteries of the world. The legend of the unicorn has existed in Chinese Mythology for thousands of years! The Chinese people felt that the Unicorn showed itself to human beings who were on important missions and this appearance was seen as an auspicious omen. Over the years and in different cultures, the unicorn has taken on several guises such as a horse, goat, deer, an ox, or a combination of all or some of these – but what seems to be consistent is the horn in the middle of its forehead over what we psychic’s call ‘The Third Eye’. No wonder then, that the beautiful unicorn is synonymous with all things spiritual. The unicorn is mentioned in the bible. “Will the unicorn be willing to serve thee?” – Job. “My horn shall be exalted like the horn of the unicorn” – The book of Numbers. The Unicorn has also been a part of the official seal of Scotland since the reign of King Robert 111 in the late 1300’s where the unicorn was incorporated into the royal seal as definition of purity and strength. However, after the death of Elizabeth 1st, when James V1 became King James 1 of both England and Scotland, he had a new royal coat of arms drawn up that included the English Lion and the Scottish Unicorn. According to legend, the blood of the unicorn has various healing properties. 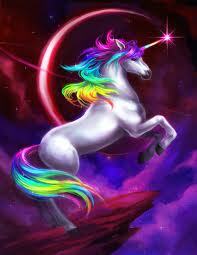 I am never surprised when a unicorn appears in my mediations as they are always beautiful, peaceful and insightful. Sometimes they have wings like the Pegasus, but they still always show themselves with the horn. I call this creature a ‘Unipeg’ and I tell my little grand-daughter many bed-time stories about the Unipeg and his friends. Just like me, she loves everything about Unicorns and has a favourite unicorn toy that she takes to bed with her. Earlier this year, my husband and I decided to go on a trip to Glastonbury. I had always wanted to visit this spiritual town and I was really excited. The day before we went, I was sitting on our garden swing when I felt a shift of energy and the most amazing sense of peace waved over me. I asked my spirit guide what this was, and I was shown a vision of a unicorn. I didn’t understand this at the time but knew that I had been given this totem for a reason, and all I had to do was to trust and believe. True to form, John and I had some amazing experiences in Glastonbury, but for me, the unicorns seemed to be prominent throughout. I literally saw them everywhere. On the day we set out on our journey, I saw a wagon drive past with the name Alison on the side and I felt at that point that I was being told I was starting out on an adventure!. When we arrived at Glastonbury we stayed at the George & Pilgrim Hotel which was built in the 1400’s. On the wall in the dining room of the hotel there was a medieval painting of a maiden and a unicorn. Once we had settled in, we went for a walk around the town of Glastonbury and in one of the shops I saw a lovely unicorn ornament. We were travelling to Cornwall the next day as I wanted to see St. Michael’s Mount, but John promised he would buy me the unicorn on our return to Glastonbury so we could climb to the top of the Tor, and visit the Chalice Well Gardens. As we started out on our trip to Penzance, we were in a queue of traffic and I had been reading. My husband said “Ali, look up in front of you” and I saw a lorry with the words ‘Horseshoe Distributions’ on the side. We stopped at a service station and I bought a copy of the Soul & Spirit magazine. Inside the magazine was a small booklet called ‘Soul Secrets’ and the majority of it consisted of information about unicorns!. I read with interest, an article by the author Diana Cooper called ‘The wonder of unicorns’, and so much of it resonated with me as she explained having a similar experience to the one I’d had in the garden, feeling a different shift of energy – a stillness. I felt at this point that I would be researching more about unicorns in general and sharing their peaceful energy with others. As I asked for confirmation of this, I looked up into the sky to see a cloud formation in the shape of a large Angel. Once I had seen the vision, the cloud changed shape again but it had stayed long enough for me to know in my heart, that I had received my message from above. We had a couple of lovely days in Cornwall before driving back to Glastonbury again. As we reached St. Isaac we drove past a house with stone unicorns on the gatepost. 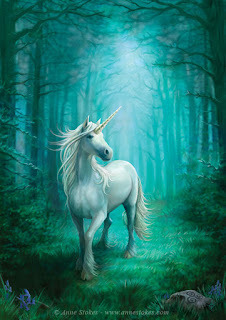 Further on into our journey, I was reading more about Diana Cooper’s experiences with unicorns. Our car jerked forward and I looked up to see what had happened. I saw a caravan, with the name (make) - ‘Unicorn’! Back again in Glastonbury we stayed at the Daisy Angel Retreat Centre and I went back to the shop we had visited earlier and John bought me the unicorn he had promised me which has now got pride of place on the mantelpiece in my living room. The unicorn symbolises faith, healing and mystery. As a creature of mystery and myth, the unicorn can assist in opening up your imagination as you experience the beauty and wonder of universal energy. The unicorn’s horn symbolises the third eye, and you can deepen your visualisation through meditating. Remember to have faith in all that you do; having ultimate belief in your own capabilities, making your dreams come true as the unicorn has the ability to restore broken spirits. As a totem, the unicorn can be powerful and yet at the same time, very gentle. When my granddaughter Olivia stays at our house, we love to watch the film Fantasia together by Walt Disney, which was made in the 1940’s (before both our times!) and has now been digitally restored so we can enjoy Fantasia in the way that Walt Disney had envisaged. As the man himself said “Fantasia represents our most exciting adventure”. The film is all about an imaginative escape from the material world in which we live and I feel that such a small piece of escapism never harmed anyone. Fantasia is a vision of animated adventures set to pieces of beautiful classical music played by the Philadelphia Orchestra. Our favourite segment is that of ‘The Pastoral Symphony (6th)’ by Beethoven. Walt Disney was a nature lover and the scene opens showing the slopes of Mount Olympus. The land is rich in colour and takes us into the magical world of Unicorns, Pegasus, Centaurs, Cupids and Fauns. Towards the end of the music, we see a festival being held by the mythological creatures to honour the God of Wine Bacchus. Everyone is having a great time, and Bacchus is depicted as being rather inebriated! The festivities are eventually interrupted by Zeus who stages a dark thunderstorm, hurling bolts of lightning at Bacchus which has been created by Vulcan. The bolts of lightning strike the large wine vat which floods the whole area with torrents of red wine, causing chaos. All the creatures dive for cover until the thunderstorm ceases. After a time, tranquility returns to the countryside as Iris draws a beautiful rainbow across the sky. When the sun begins to shine, it is symbolised by Apollo riding a fiery chariot drawn by three horses in the sky, and the baby Pegasus cupids and unicorns play amongst the healing colours of the rainbow. As day falls into night, Morpheus is shown covering the land with his cloak of darkness. The best is yet to come as Diana, the goddess of the moon appears in the sky to shoot a fiery arrow-comet which has been formed by the crescent of the new moon. The stars scatter, falling into their rightful place in the sky and once again peace and serenity are restored in the Elysian Fields. Researching the history of the Unicorn on the internet, I came across a picture of a unicorn within a mosaic on a 1213 church floor in Ravenna. There are many more pictures and paintings of unicorns throughout history such as ‘Chastity with the Unicorn by Francesco Di Giorgio Martini, ‘Maiden with a unicorn’ (1480) by Da Vinci, and my favourite ‘Portrait of a young woman with a Unicorn’ by Raphael Sanzio. It is suggested that the unicorn may represent Christ or Purity. I have taken text from part of a book I am writing about my own spiritual encounters. This particular extract is taken from a diary account of my experiences on a recent 3 day Angelic Reiki course. Every time I think about what happened, I feel humbled and blessed to have been a part of that experience. ‘Partnered up this morning in the healing session with Mark, I started my healing on him. As before, I called upon the Ascended Masters, but we had also been asked to bring in the healing energies of the Galactic Healers. These are cosmic beings of 100% light and they can show themselves to you in any form. I commenced the healing on Mark by calling forth my healing angel (who I now know is Leila). I called upon the Ascended Masters and I could see Quan Yin to my right. I could also smell the beautiful scent of roses again, so I knew that Lady Nada was also present. I saw a lot of yellow around Mark’s head which is for ‘new knowledge’. I then called in the Galactic Healers of 100% pure light. I didn’t see anything at all, but felt a shift of energy and a warm sense of peace around me. As I turned to my left, to my utmost surprise, I could see a white Unicorn with a golden horn. I questioned this, thinking it must be my imagination and looked away, but when I looked back again the Unicorn was still there and his eyes were the deepest blue and were full of pure love. I felt really emotional as I realised that this was one of the Galactic Healers who had shown himself to me in the form of the trusted Unicorn. Those eyes were all-seeing, and they looked at me as if to say ‘Yes I am here, and no, it is not your imagination, and he nodded/bowed in confirmation. When it was time for all the energies to disconnect from the healing, I could see that the Unicorn had wings and I ‘saw’ him flying home through the galaxy’. 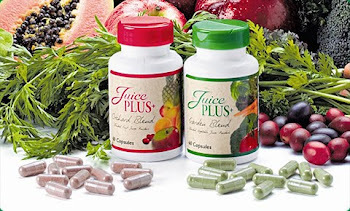 This is how I retain my high energy levels, I feel radiant every day, and you can too... Live Life To The Plus! My New Book Now Available!